Three celebrity chefs compete with recipes using Pepsi products. PepsiCo is promoting zero-calorie drinks on Fox’s TV broadcast of Super Bowl LI, but online the snack and beverage company is also showing consumers how to cook with them. The halftime sponsor has partnered with Tastemade on a Super Bowl contest that challenges celebrity chefs to create the "ultimate football food" using its products. This week, PepsiCo launched "Game Day Grub Match," a three-part digital video series that features three Tastemade chefs—Megan Mitchell, Josh Elkin and Frankie Celenza—competing to win tickets to the Big Game in Houston, Texas. Hosted by former "Chopped" contestant Jet Tila, the series is being promoted on the social media channels of both brands. PepsiCo, which is sponsoring the half-time show for the fifth time, will promote a range of products on Fox’s broadcast of Super Bowl LI, including the new water brand Lifewtr and Pepsi Zero Sugar. The chefs had to use two PepsiCo products in their recipes. "The Super Bowl is a huge stage for PepsiCo and our brands," said PepsiCo Executive Chef Stephen Kalil, in a statement. "Every year we look for new ways to bring the excitement of Super Bowl Sunday to life for fans across the country, and ‘Game Day Grub Match’ brings the worlds of food and football together in a way only PepsiCo can." PepsiCo’s push to provide more digital work around the Super Bowl began last year when the company increased its digital spend to 40 percent of its Super Bowl budget. "We are activating, not just leading up to the game and [during] the game, but also on the ground, across more brands than we have before," Pepsi CMO Seth Kaufman told Adweek last year. "Game Day Grub Match" includes three 10-minute videos featuring the chefs going through three rounds of cooking competitions. For each round, they had thirty minutes to create their best game day dishes which had to include two PepsiCo products, resulting in bizarre combinations like Quaker Oats and Naked Juice ice cream sandwiches and Wild Cherry Pepsi ribs served on top of Sabra Farmer’s Ranch Greek Yogurt Dip. 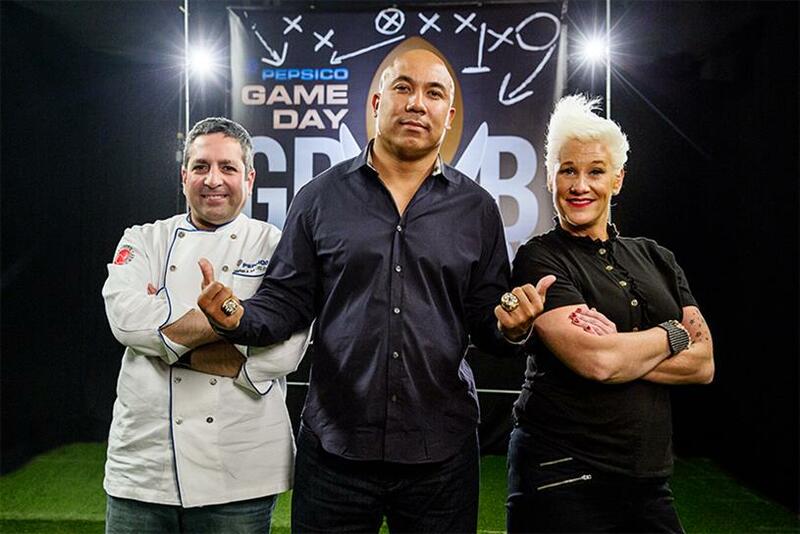 "Our food and beverage products have tremendous culinary versatility and these three Tastemakers created some truly inspiring recipes that are certain to be crowd-pleasing favorites," said Kalil, who judged the contest along with Food Network chef Anne Burrell and former Pittsburgh Steelers wide receiver Hines Ward. PepsiCo’s Super Bowl activity will also include activations for Pepsi, Mountain Dew and Lipton Iced Tea. Lady Gaga will perform in the halftime show.